Home » sake and food » sake+chocolate. a many splendored thing. 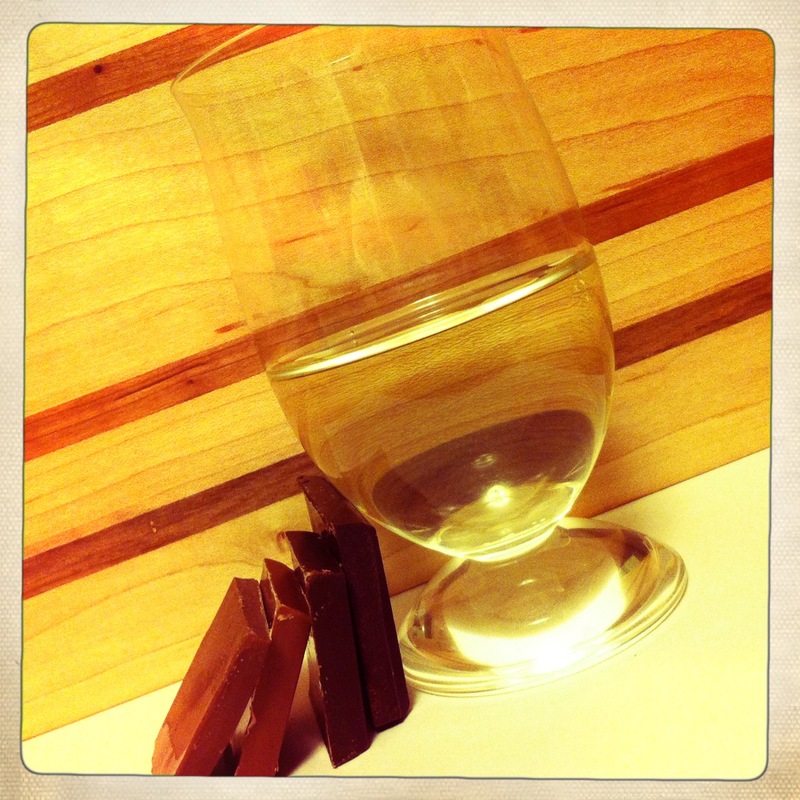 sake+chocolate. a many splendored thing. It’s Valentine’s Day and all across America many people are struggling to buy the right gift for their loved ones. Chocolate is a must but what else could you pick up to make the night extra special? You have to ask….? Pairing Sake with chocolate is not a common practice but as we have seen in the past Sake’s versatility and complexity make it a perfect pair with a wide range of foods. I struggled with an idea that would be entertaining to readers but also present information that they could use. When pairing foods with alcohol, rarely is there a “bad” pairing but there are pairings that go outside the scope of what one is trying to accomplish. 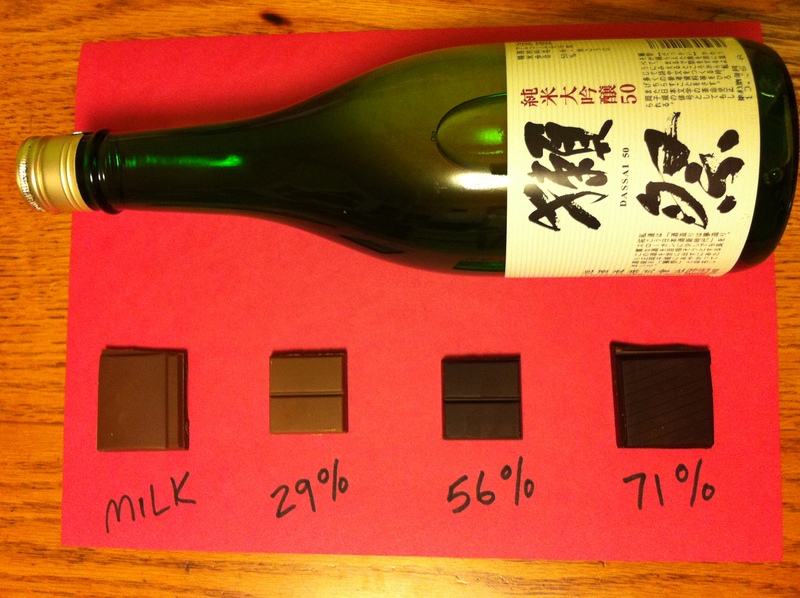 To delve into the idea of Sake with chocolate, we will look at one Sake paired with chocolates of varying cacao content. The stronger the cacao percentage, the earthier and more robust the chocolates become; their interaction with the Sake varying as well. The Sake – Dassai 50 Junmai Daiginjo. Asahi Shuzo Co. Yamaguchi. This well rounded Sake brings notes of apple, pear, honey, and a sweet rice finish that lingers with honey and apple peel. A mildly dry Sake that mixes all of that complexity with a soft acidity that will make you want another drink…maybe another bottle. Milk Chocolate: the lowest of the cacao contents, this sweet and creamy Belgian milk chocolate struggles to overwhelm the Sake. The two different impressions of sweetness battle for attention; the dairy fat sweetness of the chocolate and the water based fruity sweetness of the Sake. The complexity of both are sadly lost here. The finish is of one-dimensional cream and alcohol warmth. Not terrible, but there is no magic to be found here. 29% Cacao: with a cacao content on the high side of milk chocolates, this chocolate has the creaminess of a milk variety but with a touch of earthy bite and a firmer texture. The greater complexity of this chocolate serves to bring out notes of coffee and caramel when blended with the Sake. The slight earthiness also pulls out some of the orchard fruit notes in the brew, with a sweet and clean finish. This is a much better pairing, especially for someone not really interested in darker chocolates. 56% Cacao: a medium dark chocolate that is really starting to deliver on the earthy notes with hints of almond and coffee. Blending with the Sake, this chocolate is a bit of a roller coaster ride – starting with a cocoa earthiness with hints of orange and almond, then diving into a valley of rice alcohol warmth and creaminess; finishing with a delightfully clean (almost light) impression of fruit and vanilla. An excellent pairing that brings out new flavors from both the Sake and chocolate. 71% Cacao: a deep earthy and bitter chocolate that has notes of cocoa, cherries and cinnamon. The deep flavors from the cacao are a perfect match for the Sake and the lower fat content allows the Sake flavors to shine through. The sweetness from the chocolate is unburdened by dairy fat and is allowed to let the apple and honey notes in the Sake play an important role. Blending smoothy with notes of cherry and spice from the chocolate, the Dassai 50 finishes this pairing with a clean rice impression in harmony with a slight coffee and dark pit-fruit flavor from the cacao. Awesome. Having never done this type of tasting with Sake before it is clear to me now that as the cacao content rises and dairy fat lowers, the chocolate is able to truly pair with the Sake. The harmonious nature of the second two pairings are a perfect example of this concept; the chocolate and the Sake supporting each other and mingling in a way as to bring out the best of both. In the end, isn’t that what Valentine’s Day is all about.